The Call for Presentations is OPEN! The 2012 NAEA National Convention theme, Emerging Perspectives | Connecting Teaching, Learning, and Research, focuses on the idea that we are better educators when we collaboratively explore what it means to be teachers and learners, and how research can improve visual arts education spanning all educational levels and environments. We have many perspectives and one focal point: the power of visual arts education to fulfill human potential. In New York City, NAEA will mark its 65th anniversary, and celebrate as our past, present, and future come together. What better place to celebrate who we are as artists and educators than New York City—the great melting pot—the arts capital of the world! The value of any conference can be measured by the connections we make, with people and ideas. I invite you to join us at the 2012 NAEA National Convention and make those connections! The NAEA National Convention is an annual conference providing substantive professional development services that include the advancement of knowledge in all sessions, events, and activities for the purpose of improving visual arts instruction in American schools. As such, it is the world's largest art education convention. The four-day convention includes over 1,000 participatory workshops, panels, seminars for job-alike groups . . . research reports, discussions, exhibits, and tours . . . keynote addresses by world-acclaimed educators, artists, researchers, and scholars . . . with the opportunity to connect with your colleagues from all over the world. Each year some 140-200 exhibitor booths displaying the latest art textbooks, high-tech software, prints, slides, curriculum materials, equipment, and programs, as well as the latest studio and art history media are made available for examination and review to art educator delegates. It is a professional development opportunity to update yourself on the vista of state-of-the-art materials to advance visual art instruction in your program. The annual convention is held in the spring, usually March or April. Information about the site, hotels, etc., may be found in summer and fall issues of NAEA News, as well as on our website at http://www.arteducators.org/convention. If you wish to be a presenter at the convention, proposals must be submitted online and NAEA membership is required. 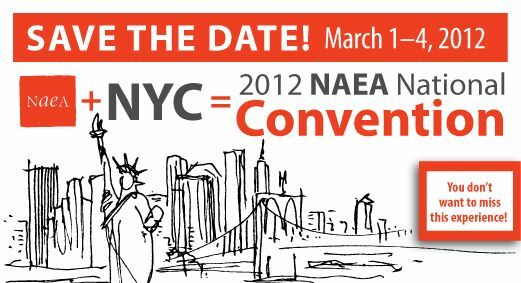 The deadline for submitting proposals for the 2012 NAEA National Convention is May 15th, 2011. A preliminary convention schedule is published in a special edition of NAEA News.